Thursday we flew from El Calafate to Mendoza with a layover in Cordoba. The first flight was three hours and then we had a 5 hour layover before taking an easy hour flight to Mendoza. Denise worked all day at the airport getting the pictures uploaded to our blog and I did a little homework on Mendoza. Today we headed to Santiago, the capital of Chile. This was our longest bus ride and lasted 9 hours. We had to stop and go through customs once arriving in Chile and this was around 3 and half hours. We got a little sleep, but not as much as we would have liked. We got the regular seats even though someone told us always get the premium bus seats. We learned the hard way there is a big difference, but on the positive side we did save a little money. Mendoza is a small city with natives from Italy, Chile, Spain, and France just to mention a few. There are restaurants, bars, shops, ice cream shops, many parks with fountains, and a nice small town feel, oh and then there are the wineries, over 900, 180 that you can visit. Argentina’s most highly rated Malbec wines originate from Mendoza’s high altitude wine regions located at the foot of the Andes mountains, which we traveled through today. Mendoza is very important to Argentina, producing more than 2/3 of the country’s entire wine production. They make great Cabernets, Chardonnay, Syrah, and Sauvignon Blancs, but Malbec is what defines Mendoza. They have great agriculture with the ideal weather. No extreme temperatures and a run off of water from the top of the mountain which is regulated, complex, and something I was very interested to learn about. We visited four wineries on Friday. They were all smaller wineries and favorites of our guide Javier. He was a class act and his choices of wineries were perfect. Our first stop was Domaine St. Diego. It was a family owned winery and most of their wines could only be bought at their winery. The owner and winemakers daughter showed us all around her family’s vintage. We learned about older vines and younger vines. She compared them to human beings, saying when they are young they are unpredictable and from size to flavor are not consistent. The older vines have a stronger grip with their vines going deeper in the soil and they are more consistent. She was also vey proud of their olive oil and extra virgin olive oil was usually served with the wine tastings. She encouraged us to drink the oil out of the bowl to get the pepper flavor at the back of our throat, saying that all good olive oils have three flavors: spice, fruit and bitterness, with one always stronger than the rest. I’m afraid I’m going to find Denise sipping out of our oil when we get back home. Our second winery that we visited didn’t even have a name (Denise loved that), but it was owned by the family of a friend of Javier’s, Ricardo Santos. They export all over the world. He opened up a few bottles of wine and we talked about life, wine, and even solved a few world problems. We just forgot the solutions later. We then enjoyed a five course meal with wine matching at Melipal, the shiniest winery of the bunch. Lunch was great and the service was impeccable. Finally the Carmelo Patti winery was a perfect ending. The winemaker and owner, Carmelo Patti, was in his 70’s and his family moved him to Argentina from Sicily when he was only one. He’s very proud of his way of making wine and it was a pleasure and honor to enjoy it with him. We stayed in B&B Italia which was family owned and operated. Mercedes was our host along with her husband Tito and son Javier. She was a lovely woman who went beyond and above to make us feel like we were at home. It had been her home for 42 years. The night we arrived just happened to be the end of their Italian Festival which was located directly across the street in the Italian Plaza. There are four small plazas named after different heritages throughout the city, with one large one in between all of them. We opened our windows as soon as we got into our room to the sounds of the band practicing for the night’s performance that starts at 10:00. We even heard the Godfather theme played on an electric guitar. Everywhere we have been in South America we’ve noticed that the night starts late and continues to the wee hours in the morning. Later that night we dined at Anna’s just a few blocks away from our B&B and one of the many recommendations Mercedes gave to us. We tried out the Festa Italiana and it was similar to ours back home with the exception of not being able to understand Spanish. Pizza and Italian pastries were being served by older women.. The kids ran around and played games, while the men sold tickets for all of the vendors. Who knew this identical world existed all these miles south, and somewhere that’s not in Italy. I told Javier, Mercedes’s son, about our same tradition at home and he couldn’t imagine an Italian festival in the Midwest where Italian immigrants sang and spoke English. 1. Bring plenty of U.S. dollars. The blue market is something you should research. If we would have known we would have saved 40% on everything that we purchased including our hotels and some transportation. We used all of the cash we had with us but could have saved a lot more dinero if we’d had more dollars. 2. 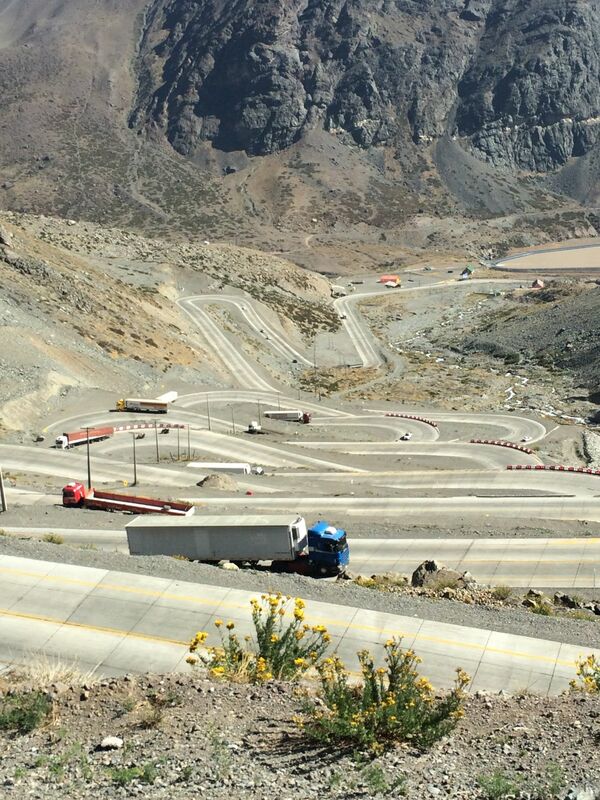 Taking the bus across the borders of Argentina and Chile will save you a significant amount of money and give you a great view. The roads through the mountains are crazy and filled with hairpin turns and beautiful scenery. But it can take up to 4 hours to go through customs, making the whole trip 9 hours and sometimes more. 3. Read this one after Denise’s post. Always look where you’re going, especially in Mendoza. You never know when a ditch may be approaching you.